Features Fixed, Two Column, Blue, Left Sidebar, Abstract. 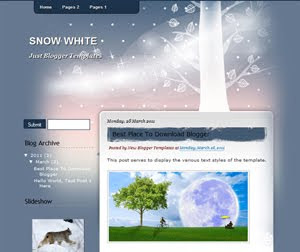 Descriptions Snow White is free blogger templates with blue background, two column and with categories abstract blogger templates. This blogger templates very good for personal blog, Compatible on all browser and very good for personal blog.